The Blue Ridge Parkway is a magnificent 469-mile ribbon on asphalt from Skyline Drive and Shenandoah National Park in Central Virginia to Great Smoky Mountains National Park in North Carolina. The Parkway is often called "America's Favorite Drive," and for good reason: the beauty to behold from the overlooks is unsurpassed. As you're traveling the Blue Ridge Parkway, Rockbridge County is accessible from three points: Vesuvius, Buena Vista, and Glasgow. Meandering in and out of Rockbridge County between Buena Vista and the Peaks of Otter, the Parkway's lowest and highest elevations are experienced. Enjoy the ride! Detour at Tye River Gap onto Route 56 west, a winding road toward Route 11 and Interstate 81, featuring delightful lodging, meals, and wine, all within eight miles of the Parkway. This winding descent along Route 60 west leads you to the industrial town of Buena Vista. Stop at the Visitor Center at the base of the mountain to get a local map. Hungry? Fill up at JJ's Meat Shak. If it's a good time you're looking for, Glen Maury Park is within seven miles of the Parkway and has you covered. It's 315 acres with camping, golfing, fishing, and special events. As you exit the Parkway onto Route 130 west, you'll find yourself on a Virginia Scenic Byway. Continue straight onto Route 501, winding your way along the James River. After approximately nine miles, turn right, following Route 130 to enter the town of Glasgow. You'll be greeted by at least one of Mark Cline's creations, a dinosaur, on the right side of the road as you pass through. Continuing approximately 6.2 miles, you'll arrive at Natural Bridge State Park as well as Natural Bridge Caverns. The Bridge is a natural wonder once owned by Thomas Jefferson and the caverns are the deepest on the East Coast. Stay the night at Natural Bridge Historic Hotel & Conference Center with Blue Ridge Mountain views, or perhaps choose a pet-friendly cottage. Enjoy dinner on-site at the Colonial Dining Room. 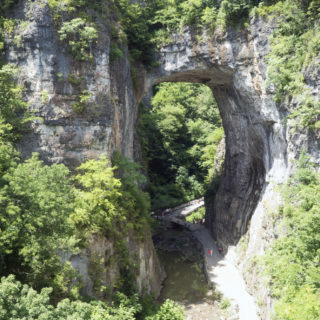 Natural Bridge is approximately 15 miles from the Blue Ridge Parkway. From any of the Rockbridge County Blue Ridge Parkway entrances/exits, Lexington is a hop, skip, and a jump. In our Main Street Community you'll find independently owned shops offering everything from apparel and outerwear to gifts, wine, and even yarn. Dining downtown is an excellent idea. Our chefs source their ingredients locally and prepare fine meals to suit any palate. Enjoy our classic coffee shop experience at Lexington Coffee or treat yourself to a cuppa joe or gelato at Pronto Gelateria. Try a wood-fired pizza at Salerno's for lunch, then make a plan to enjoy an afternoon cocktail at TAPS. If beer is more your style, Brew Ridge Taps has more than "99 bottles of beer on the wall." Secure a room for the night at The Georges, Robert E. Lee Hotel, or Hampton Inn Col Alto, and then splurge on a fine dinner at The Southern Inn, Rocca, or Bistro on Main. 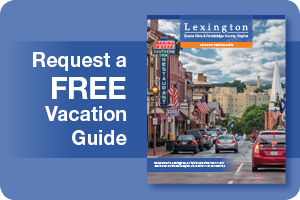 You're going to love what awaits in Lexington!